BOOK RATING An inspiring and useful guide for those seeking to build an environmentally sustainable business. GREEN RATING Deep Green. Book is printed on Forest Stewardship Council (FSC) certified and recycled paper. For those who haven’t heard of Patagonia, there is a very good reason why: it simply does not promote its outdoor apparel to people that do not need them. This business philosophy stands out when the Timberlands and North Faces of the world are hawking their outdoor gear to city slickers that will use them mainly in the extreme conditions of IFC or Festival Walk. Patagonia’s products on the other hand are highly sought after by true outdoor enthusiasts. 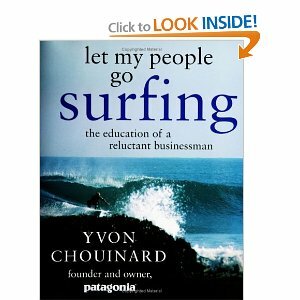 This book by Patagonia founder, Yvon Chouinard, is truly a refreshing change from business books written by egomaniacs like Jack Welch and Donald Trump or by out of touch ivory tower academics. The title “Let My People Go Surfing” refers to the company flex-time policy that when the surf is up, you can drop what you’re doing and go surfing so long as you get all your work done properly. It is structured broadly into 3 sections: (1) “History” which reads like an autobiography; (2) “Philosophies” of product design, production, distribution, image, finance, human resources, management and environment provides practical guidelines enlivened by great stories; and (3) “1% For the Planet” which discusses the companies philanthropic initiatives. Patagonia made the switch from conventional to organic cotton within 2 years. This change was made despite the 3 fold increase in cost that resulted. Again they showed their leadership by achieving their 3 goals: (1) to successfully sell the clothing line, (2) encourage other companies to used organic cotton, and (3) to encourage farmers to grow it. They reduced their profit margin thereby making it easier for consumers to accept the switch. Almost 20 years later, we see muji and H&M touting their very limited organic cotton collections. 3. From 1985-2005, Patagonia donated US$ 22 million to green NGO’s. In 2001, Chouinard cofound “1% For The Planet” to encourage companies to pledge 1% of sales to green NGOs. In contrast, recently here in Hong Kong, Friends of the Earth requested donations from many blue chip companies for a food recycling program, the response they got was distinctly underwhelming. 4. Chouinard also realized that overpopulation is closely related to the deterioration of the environment. So, in addition, to donating to green groups, he donated to Planned Parenthood, a family planning organization. However, in doing so, he offended the Christian Action Council (CAC). CAC organized a campaign to send thousands of letters threatening to boycott Patagonia and led protests outside its stores. In a move that NYTimes decribred as “courageous”, Patagonia started “pledge a picketer” campaign that pledged to donate US$ 10 to Planned Parenthood for each picketer that showed up outside its stores. In the Philosophies section, Chouinard explains their philosophy of designing clothes that don’t go out of style and are extremely durable. These philosophies stand in direct contrast to Apple which builds products that either become technologically obsolete within 2 years or simply breakdown and end up as toxic iTrash that poisons the earth for another 1000 years. Me: How many plastic drink bottles does Coca Cola company sell in Hong Kong each day? Me: Is Coca Cola responsible for recycling these plastic bottles? How many of them are recycled? Coca Cola: No, there is no government requirement for us to do so. We do not track that figure as a company, but according to Hong Kong government data, the recycling rate for these bottles is less than 4%. Me: That means everyday 960,000 Coca Cola bottles end up in the landfill. In comparison to this number, do any of the environmental measures you just discussed have any meaning? Lets call these companies out when they use green wash and start holding them accountable for living up to their own corporate social responsibility statements.